The information outlined below on common hand conditions is provided as a guide only and it is not intended to be comprehensive. Discussion with Ms Moon is important to answer any questions that you may have. For information about any additional hand and wrist conditions not featured within the site, please contact us for more information. Many peoples notice small bony bumps on the back of the joint. These are osteophytes, which are bony swellings associated with an osteoarthritic joint. In the hand they are called Heberden's Nodes. 1. Pain at the base of the thumb, aggravated by thumb use. 2. Tenderness if you press on the base of the thumb. 3. Difficulty with tasks such as opening jars, turning a key in the lock etc. 4. Stiffness of the thumb and some loss of ability to open the thumb away from the hand. 5. In advanced cases, there is a bump at the base of the thumb and the middle thumb joint may hyperextend, giving a zigzag appearance. 1. Avoiding activities that cause pain, if possible. 2. Analgesic and/or anti-inflammatory medication. A pharmacist or your family doctor can advise. 3. Using a splint to support the thumb and wrist. Rigid splints (metal or plastic) are effective but make thumb use difficult. A flexible neoprene rubber support is more practicable. 4. Steroid injection improves pain in many cases, though the effect may wear off over time. The risks of injection are small, but it very occasionally causes some thinning or colour change in the skin at the site of injection. Improvement may occur within a few days of injection, but often takes several weeks to be effective. The injection can be repeated if needed. e. Denervation, which means cutting small nerve branches that transmit pain from the arthritic joint. Removal of the trapezium is the most commonly performed operation. Ms Moon will advise you on the best options for your thumb. Cubital tunnel syndrome is compression or irritation of the ulnar nerve in a tunnel on the inside of the elbow (where your 'funny bone' is). The ulnar nerve provides sensation to the little finger and part of the ring finger, and power to the small muscles within the hand. Dupuytren’s contracture (also referred to as Dupuytren's disease) is a common condition that usually arises in middle age or later and is more common in men than women. Firm nodules appear in the ligaments just beneath the skin of the palm of the hand, and in some cases they extend to form cords that can prevent the finger straightening completely. The nodules and cords may be associated with small pits in the skin. Nodules over the back of the finger knuckles (Garrod's knuckle pads) and lumps on the soles of the feet are seen in some people with Dupuytren's disease. A fracture (break) can occur in any of the bones in the hand. Each bone is named (See diagram). The fracture can be simple (two fragments) or comminuted (many fragments). The fracture can be closed (no break in the skin) or open (compound) where there is a break in the skin over the fracture. Fractures can be complicated by the involvement of the joints at either end of the bone (Intra-articular fracture). Fractures may occur as part of a more complex injury where there has been damage to other tissues such as tendons, nerves and blood vessels. The outcome following any fracture depends on many factors including how you and your hand responds to the injury. The outcome will generally be worse in those injuries which involve joints and if other structures such as tendons and nerves have been damaged. You should ask the team treating you to explain what the expected outcome may be and how long it may take to get there. The final outcome may not be easy to predict as there are so many variables that can affect the end result and the surgeon's and therapist's view may change during the treatment. Ganglion cysts are the commonest type of swelling the hand. They contain a thick clear liquid called synovial fluid, which is the body's lubricant in joints and in the tunnels through which some tendons run. 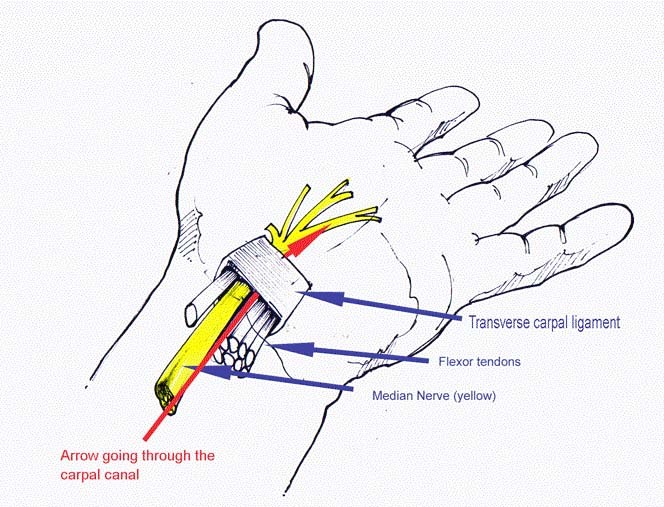 Although ganglion cysts can arise from any joint or tendon tunnel, there are four common locations in the hand and wrist - in the middle of the back of the wrist, on the front of the wrist at the base of the thumb, at the base of a finger on the palmar side, and on the back of an end joint of a finger. Flexor tendon sheath ganglion cyst. 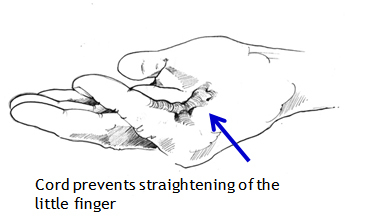 Typically occurs in young adults, causing pain when gripping and feeling like a dried pea sitting on the tendon sheath at the base of the finger. Puncture of the cyst with a fine needle can disperse it – like puncturing a balloon - and fewer than half return. Persistent cysts can be removed surgically and the risk of recurrence is small. Microsurgery is a technique whereby surgery is performed on very small structures utilizing intra-operative magnification (with an operating microscope), very fine instruments and sutures, and specific techniques. Microsurgery allows for very precise surgery on small objects, which would not be possible with the unaided eye. In the hand and wrist, blood vessels and nerves are commonly no larger than one to two millimeters in diameter (equivalent to the thickness of a pencil lead). By employing contemporary microsurgery techniques, instruments, and the operating room microscope, we can increase the prognosis for successful blood vessel and nerve repairs, as well as digital replantation. A nerve injury can occur when the finger, hand, or wrist is cut, overstretched, crushed or burned. Symptoms include numbness and difficulty moving the affected area. Causes of hand & wrist nerve damage Injury to nerves in the hand or wrist is often caused by trauma, such as the area being cut, overstretched, crushed or burned, damaging the nerve or nerve ending. • Skierʼs thumb (sometimes referred to as Game Keeperʼs Thumb), a highenergy injury in which the ligament at the base of the thumb is torn. This occurs when the patient falls forward and the thumb is bent backward. • Tennis elbow, in which a tendon on the outside of the forearm fails and begins to tear away from the bone. While this injury originates near the elbow, pain may extend down the forearm. • Golferʼs elbow, similar to tennis elbow, this injury affects the tendon on the inner side of the elbow. • De Quervainʼs tendonitis, inflammation of the tendon that runs down the forearm, through the wrist, to the thumb. This injury is brought on by many activities including using a keyboard, golfing and fishing (particularly flyfishing). • Wrist fractures, which can occur with many athletic activities; one of the most frequently seen injuries in beginning rollerbladers or snowboarders who tend to fall backward on their hands. • Jamming a finger, or "basketball finger," occurs during any athletic activity where the hand comes in contact with a ball. This injury ranges in severity from a sprain to a simple dislocation that may be corrected when the patient pulls on the finger to a more complex, serious dislocation or fracture of the joint. • Tendonitis may also be seen in weight lifters with poor technique or in those who attempt to lift too much weight too soon. Similarly, beginning yoga practitioners may develop the problem by attempting postures that place too much stress on tendons that are not yet ready to accommodate it. Regardless of the severity of the injury, prompt attention from an orthopedist can make an important difference in the patientʼs long-term recovery and ability to continue participating in sports. If the hand, wrist or finger is fractured, failure to get timely treatment will eventually result in arthritis and considerable pain. Fortunately, many of the injuries described can be treated with simple procedures that yield excellent long-term results. Jammed fingers that are dislocated can be relocated, that is, put back in proper alignment, often in the orthopaedic surgeonʼs office. If the finger is broken, the joint may need to be immobilized. A program of rehabilitation exercises helps patients prevent or reduce debilitating stiffness. Skierʼs thumb can be treated with a simple procedure in which the ligament is reattached. This operation is done under regional anesthesia (the arm is numbed) and requires no hospitalization. Repairing this ligament is crucial since the thumb is responsible for about 50% of hand function, specifically for any movement that requires opposition, such as holding a cup or using a key. As with jammed fingers, timely treatment is essential. At three months following the injury, an orthopaedic surgeon may not be able to reattach the ligament and more complex surgery may be necessary. 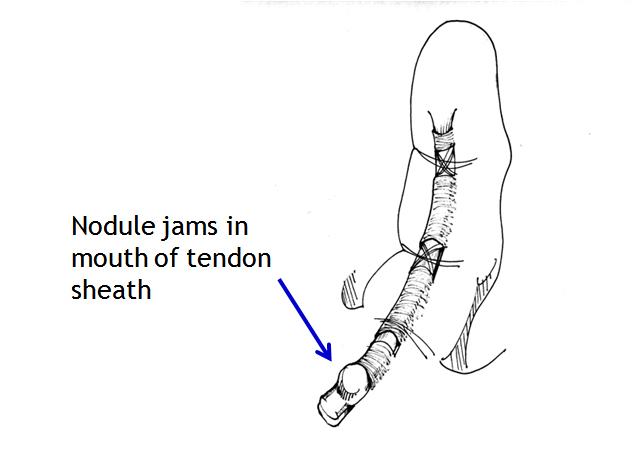 Tendon injuries that result from persistent gripping of a racquet or golf club (or poor technique) or from numerous repetitions during weight lifting may be treated in a variety of ways. The affected joint may need to be immobilized. Therapy to decrease inflammation and swelling can include ultrasound treatments or iontophoresis. In the latter procedure cortisone cream is spread on the skin covering the affected area. A small electric charge is applied to get the cream to sink in and treat the muscles and tendons below. A cortisone injection or other antiinflammatory medication may also be needed. 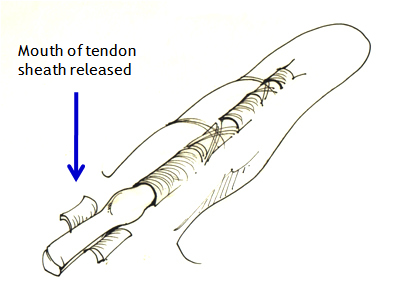 If these measures fail, surgery to open the tunnel or sheath that the tendon runs through, or in some cases remove the diseased tissue, may provide relief. Following surgery and recovery the patient receives instruction on how to alter their activities to avoid recurrence of the injury. Treatment for fractures of the wrist or finger joints varies with the severity of the break. High energy, severe impact fractures, are often the most complex and may be comminuted (the bone is broken into many fragments.) These fractures may also be open, that is, the bone pierces the skin, and can carry a greater risk of infection. A range of treatments are available to patients. In the case of severe and otherwise untreatable fractures, including those not treated promptly, joint reconstruction or replacement may be viable options. If your extensor tendons are damaged, you'll be unable to straighten one or more fingers. If your flexor tendons are damaged, you'll be unable to bend one or more fingers. Tendon damage can also cause pain and inflammation (swelling) in your hand. You'll also need to perform hand exercises regularly during your recovery to stop the repaired tendons sticking to nearby tissue, which can prevent you from being able to fully move your hand. A flexor tendon injury is generally more serious because they're often put under more strain than extensor tendons. After a flexor tendon repair, it's quite common for some fingers to not regain full movement. However, the tendon repair will still give a better result than not having surgery.